I love all things abandoned, and after finding out about River Country I needed to see it in person! In 2014 my friend and I booked a dinner at Mickey’s Backyard Barbecue at Disney’s Fort Wilderness Resort and headed over to get a glimpse at River Country, Disney’s abandoned water park. River Country is located on Bay Lake on the other side of the Contemporary. Check out this vintage map below to see where exactly it is! To get to Mickey’s Backyard BBQ, you actually enter through the front gates of River Country. The front half of the park is still open, with ticket gates, water fountains, lights, and some parking. They’ve covered over the River Country sign with a Mickey’s Backyard BBQ overlay. If you walk to the end of the open section of River Country, you see a big green fence dividing the park. This fence had multiple gaps, allowing us to get some great pictures of the abandoned park. We’ve heard since 2014 the pool was filled in and the view is much different. But first lets go back to when River Country was open, the pools were filled with water, and guests visited it every day. 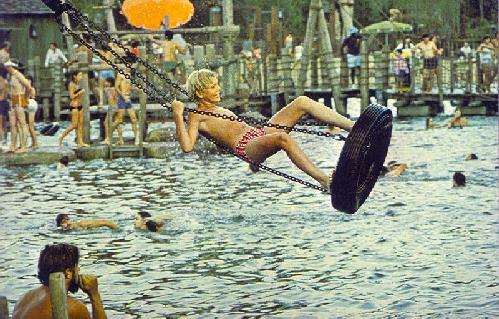 River Country opened in 1976 as Walt Disney World’s first water park. The park featured a rustic wilderness theming, complete with rocks and man-made boulders. It was described as an “old-fashioned swimming hole with “a twist of Huckleberry Finn”. There were many slides, some using pool water and some using filtered water from Bay Lake. This was one of the reasons River Country ended up closing. The park had 12 attractions from 1976- 2001, listed below. We’ve also attached some vintage pictures of the park in its glory. Upstream Plunge, a kidney shaped clean-water pool. Slippery Slide Falls, two water slides that emptied into Upstream Plunge. Kiddie Cove, a kids zone with two large water slides and a cove. This area was targeted toward preteens. Barrel Bridge, a bumpy bridge with barrels under it, similar to the one at Tom Sawyer Island. White Water Rapids, a 330-foot (100 m) long inner tube river. Bay Cove, a half-acre (2,000 m²) sand-bottom lake which featured a tire swing, boom swing, rope climb, and T-bar drop. Whoop ‘n’ Holler Hollow, two water slides, 260 ft (79 m) and 160 ft (49 m) long, that emptied into Bay Cove. Indian Springs, a very small splash zone with fountains spraying kids. This area was mainly designed for guests under age 8. Cypress Point Nature Trail, a trail among trees beside Bay Lake. River Country was one of the first water parks in the world to have extensive theming, and wowed guests on every visit. It was small and quaint, but had enough attractions for a half-day trip atleast. Below is a park map from the year before its closing. In 1989 Disney opened Typhoon Lagoon, and in 1995 opened Blizzard Beach. Both parks were much larger in scale than River Country, and had more attractions. Typhoon Lagoon is estimated to be 9 times larger than River Country. In November 2001, as it did every year, the park closed in to reopen in the spring in warmer weather. This time, it never reopened. Disney said the park would reopen if there was enough guest demand, and rumors (unconfirmed) also said a dangerous amoeba was in the Bay Lake water and the filtration process was not sufficient for swimming. Four years later in 2005 Disney finally announced that the park would never reopen, and it was left to deteriorate. Below are our pictures from our 2014 visit. Note that anyone who crosses the fence and trespasses on the property risks a lifetime ban at Walt Disney World. As you can see in this picture behind me, the fence does not do the best job of hiding the park. Disney left this area to deteriorate quickly, and did not make much of an effort to hide this area, demolish it, or transform it. This is a very unique decision on their part, as Disney is extremely detail oriented and focuses on ensuring guests have a magical experience. I was able to get a great picture of the now empty pool through the gap in the fence. It seems unreal that Disney left this view so easily accessible to guests. I also stood on a picnic table to grab this second shot. The back end of the park was not able to be seen through the fence, but on the boat ride from Fort Wilderness Campground to Magic Kingdom you can see the old tire swing and parts of the old slides. Below are pictures that others were able to snag of the interior of the park. Again note that trespassing to see River Country could result in a lifetime ban and trespassing charges. The pictures below are courtesy of Tri-circle-D, disboards.com who entered the park in 2010. Abandoned kiddy pool, once filled with water and now overgrown with grass. Note the slides in the back rocks. We were very excited to have the chance to see River Country. Our parents talk of times when they visited River Country and enjoyed the unique atmosphere and slides. We hope Disney will attempt to transform this park again, or tear it down completely. Until then, we can remember what once was and what could be again. We wish we had been able to go too, it would be awesome to compare what it used to look like in its heyday to now. That’s a great tip too, we will try to grab some good pictures! On that boat ride you also pass by the abandoned Disney’s Discovery Island, we will be writing a future article about that so keep an eye out! Thanks for checking out our blog! It’s so cool that you got such a good look around the abandoned park! It’s always been a bit strange to me that they just left it there without demolishing it, but I like that a little bit of history is left standing…even if it’s a little sad. Thanks for sharing! Totally agree, it’s so strange that they just abandoned it, but it does make for some interesting research! Thanks for reading! I love all things abandoned also!! I find them fascinating! I spent a whole day researching the old abandoned (old abandoned, lol.. couldn’t resist the Phineas and Ferb reference!!) Resort that is now AOA. I can’t believe that Disney has just left all this here to deteriorate, but kinda glad they did, because I love comparing abandoned places with how they looked in a past life! I love your IG page and blog posts, but I have to say, this one was my absolute favorite!! Wow same with Mouselet 2!! I love all things abandoned, so River Country definitely grabbed my interest! Thank you so much for checking out our blog! !